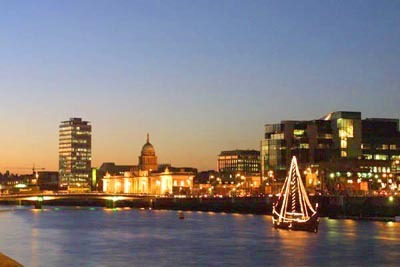 Dublin is one of Europe's most popular destinations especially for short breaks. Dublin's popularity is mainly due to it's famous nightlife.Locals, students and tourists mingle in Dublin’s bars and clubs all year round. Below are a few suggestions of areas to visit. Temple bar is centrally located. It is by far the most popular place with tourists when it comes to nightlife. In the evening Temple Bar is buzzing, especially in the summer, with many attractions such as restaurants, pubs, artists, musicians, hotels, hostels and variety of shops. There are about 24 bars and 73 restaurants/cafes in Temple Bar. The atmosphere is amazing and friendly but unfortunately there can be trouble among people who are seriously intoxicated so be careful with what you drink and who you are with and remember never leave your drink unattended! The side streets off Grafton Street offer a quieter alternative to the hustle and bustle of Temple Bar. The clubs and pubs are just as lively but attract a different type of crowd than Temple does. If one thing Dublin is not short of, it's pubs. There are 100s of pubs in Dublin. The great thing about pubs in Dublin in comparison to Irish pubs abroad and is that they are the 'real' thing. There are many types of pubs in Dublin. You can find anything from a small quiet smoky bar to a sophisticated trendy bar. Most pubs provide 'pub grub'(food) and late night entertainment. In Dublin we have a tradition called the pub-crawl. This is when you visit one pub to the next. It's not for the faint hearted. There are many type of pubs crawls. Click here to view the list of pub-crawls. Some late bars serve until 2:30am. Wine bars in Dublin have a cosmopolitan ambience. They provide their customers with an excellent wine-list and reasonably priced elegant meals. They are a great place to take a friend or business associate to sample some of the most exquisite wines from around the world.world. The Clubs and pubs close early in comparison to some other European cities. If you have the need to keeping on dancing the night away don't panic, Dublin has got some late bars where you can continue enjoying yourself. Leeson Street is a popular area of the city for part animals, with its basement clubs selling really cheap wine and a high price. The Dublin gay scene has certainly caught up with the other major European cities. Gay and Lesbian venues appear to be springing up everywhere in Dublin. Many clubs have special evenings once a fortnight.